All-weather bar baits are manufactured utilizing a special propietary extrusion process, where al the ingredients are fully blended, bonded and then shaped into weather proof bait bars. A small amount of edible wax is added to allow these uniform sized bars to be formed. 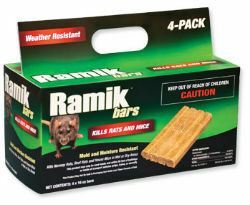 The Ramik® Bar Bait is a diphacinone anticoagulant rodenticide. Sold in a case of 4 x 16 oz.